Of course we have heard of Disney Vacation Club (DVC) – it has a ton of exposure with representatives in every lobby, and advertisements everywhere. But this was the first time I had stayed at one of the DVC resorts. My BFF and I took our daughters on an all girls trip to our second “home”, Walt Disney World. This was also the first time we rented DVC points, the price being something we could not pass up. Upon arriving at Kidani Village, we had gotten a little lost so our first view of the resort was through the parking garage, which I did not care for. One of the aspects I love about Disney is avoiding the car and parking lots during my stay. So I would much rather have enjoyed driving up to the entrance and been welcomed home. 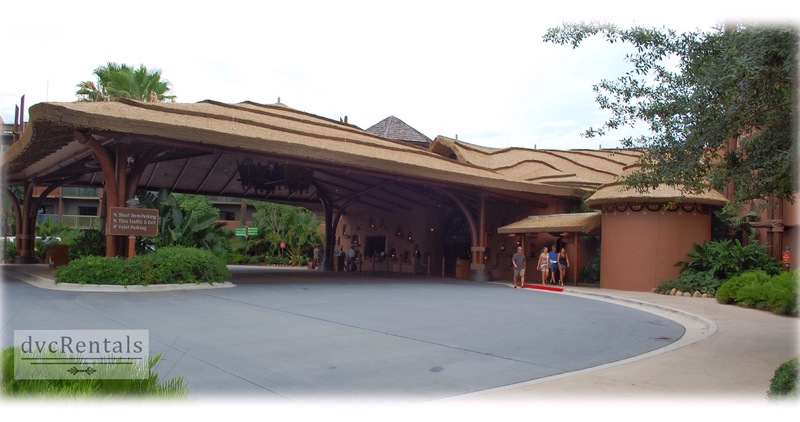 After finally finding the lobby, which I thought was lovely with beautiful hanging fixtures and seating areas, mimicking the main Animal Kingdom Lodge’s grand lobby, we were told our room was not ready so we checked our bags and headed to the parks. Rooms don’t seem to be ready very early for DVC members, as it took till late afternoon to get a text saying our room was ready. By then we were very busy at the parks, and waited till later to get to our room to unpack. I am the primary planner for our Disney trips, setting up all the details, so was I surprised when everyone’s magic bands worked but mine! When I returned to the resort, they were very helpful in straightening the issue out, and I was thankful for their help. We finally got into our room after a long day at the parks. Even though it was late, the girls went immediately to our balcony to see our view. Even an evening view is a sight, as the Savannah is lit like a moonlit night, adding to the ambiance of a night on Safari. Kidani Village is a HUGE resort. It goes on and on, in a horse shoe shape. We were lucky enough to have a sunset Savannah view which our girls absolutely loved. Amanda even excitedly told me “This is better than a pool view!”, and I have to agree. Every time we returned to our room, the girls or I would go to our balcony and see what was waiting for us there. Even night time can be exciting, with a sleeping giraffe, or grazing zebras. Between the birds calling, lighting and shadows, you truly can believe you are on a Safari. Although I have to add it is wonderful not to be in a tent and to have running water. What a nice feeling to experience the Savannah, without “roughing” it. Every day our girls would go the balcony to see which animals were out there, so they could mark what they saw, on the pamphlet Disney provides of animals in the Savannah. 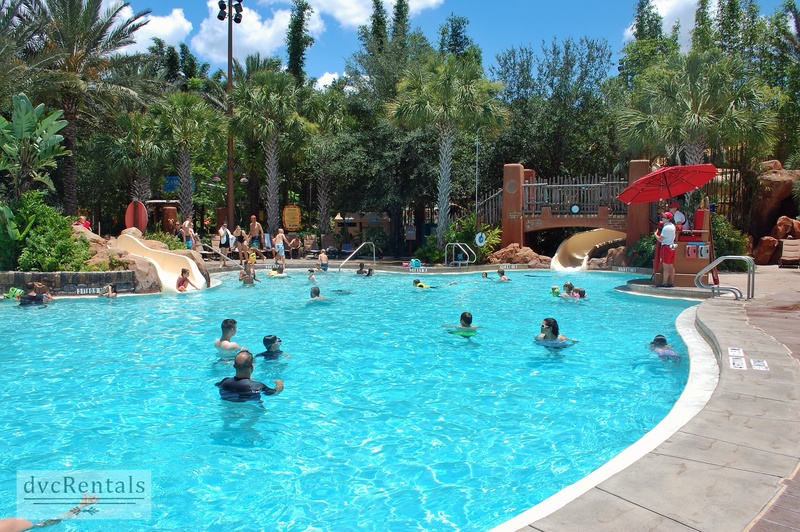 Kidani Village also has a wonderful pool. 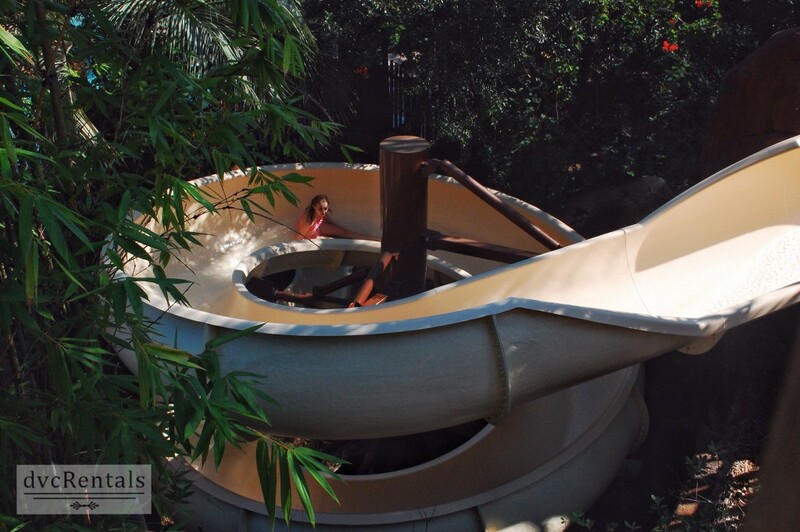 Although it is smaller than the main pool, the water slide is so much better! Two twists on the slide, lengthen your ride into refreshing waters. There are also a bunch of splash areas for little ones, and two hot tubs to soak in after a long day at the parks. We wore our fitbits and tracked 13 miles one day! So those hot tubs were wonderful! I loved our stay at Kidani Village, but I have to say my favorite part was the welcoming lanterns after a long day out on safari in the parks. Walking up to the flickering lanterns one night, I told everyone to enjoy the welcoming sight, and I hope they did as much as me. For those of you wondering about a stay in Kidani, I hope you do, as it is an incredible experience to be on safari, in the heart of Walt Disney World. I also have to add that renting through David’s Vacation Club Rentals was a breeze, and I will be doing it again. 30 thoughts on "First Impressions of a Disney Vacation Club Resort: Kidani Village at Disney’s Animal Kingdom Lodge"
Can’t wait to do this sometime!! Kidani is awesome. We rented points and stayed there a few years ago and loved it. Our home resort! I love Kidani Village!! We have stayed twice and never tire of the savannah view. Every morning the kids were out in the balcony watching the animals and as soon as we returned from the parks they were right back out there again. I could have a relaxing stay just watching the animals at the hotel and feel satisfied with our vacation. If you can’t tell it’s my absolute favorite resort. Just there May 2015 stayed at Jambo house. we absolutely loved it. The grounds were stunning, and the cast members at this resort were the best on Disney properties, so friendly and helpful! We found our little hideaway around the huge pool and miss it so much can’t wait to go back. We were a little skeptical staying at the AK resort (been to all the others) but wow what a great find! The AK will be one we will always go back too, so romantic and the atmosphere was amazing. All I can say is do yourself a favor and try it at least once, you won’t regret it, oh yeah and the bus is only 7 minutes from Animal Kingdom park to the resort!!! I love Kidani, my favorite place to stay. That was our home resort with our DVC, but we had to sell it. Miss it so much! I’m just curious how much the rooms run for? We rented an awesome room for 6 days 5 nights and paid 980 through DVC. it should have been almost 2200 for regular rental. Great deal and real cool having animals right off your balcony. That’s a really good deal. We paid $250 a night for savannah view. I found the same room listed at $450. We were very happy with price…. Loved Kidani!!! Had a very spacious 2 bedroom villa with huge balcony and savannah view. Pool was nice also! We love Kidani. We stayed there twice last year, once in a 2 bedroom standard view and the other time in a studio with a savanna view. We are definitely planning on going back. Stayed in Kidani for the first time this year. Loved the lobby, activities and being able to see the animals. We have been members since 1992 and have stayed at many resorts. The room was the worst. We were unable to get a savannah view and mainly saw a bush and a parking lot. The studio was very small and dark. There was only indirect lighting and no good reading light. Only one side of the bed had a small bedside table to put something on. It was also a very long walk to get breakfast and to get to the lobby. The rest of the place is fabulous, but I don’t think I would stay there again. Luckily I only booked two nights there and we moved on to spend a week at Saratoga springs where our room was great. Did you tell them your issues & ask for a different room at Kidani? Yes I did but all they could do is offer to get us a room at another resort. We needed a handicapped accessible room so options are more limited. We did enjoy everything but the room. The resort is wonderful.